"A sign of what was to come"
It’s time for a sermon about Kiko, my dog, or at least my dog for the last six years. Kiko’s first home was with Charlie and his son Ben. She was Kiko Noland back then. Over time she began spending more and more time with Calvin. As a consequence, she became known as Kiko Noland Kuamo‘o or at least Kiko Noland Kuamo‘o to me. I met Kiko in 2011 when I adopted Hanu from her second litter. Calvin dropped her off at my home in Wailuku early one morning. Hanu was all of eight weeks old. Within a day Calvin returned to say that although it was time for Kiko to wean Hanu, the nursing period was not quite over for her. But gradually over a period of a few more weeks Hanu was on his own. He grew and thrived. I read books and talked to others about their canine companions. We went to a dog class up in Pukalani for several weeks and later graduated. It turned out the class was more for me than it was for Hanu. But as some of you know, Hanu’s health began to fail and he died just shy of his third birthday from seizures. Later, Calvin left Maui to travel throughout Europe and the Middle East. He left Kiko with Charlie. It was during that period that I adopted Kiko from Charlie and she became Kiko Noland Kuamo‘o Alika. Calvin returned home to Maui after being away for several months. I remember when he first came to see her – she recognized him instantly - her tail wagging, her tongue licking his face, and her body wiggling with tremendous delight. I must confess I felt a tinge of jealousy. Okay, I felt very jealous over her demonstrative affection for Calvin. But I also knew enough that Kiko had formed a deep bond with Calvin that was never going to be broken or diminished in any way over time. Calvin died in early December. This sanctuary was filled yesterday with family and friends who had come to remember and celebrate his wildly adventurous life. Those of you who knew Calvin know what I mean. Family had come from Hawai‘i island and O‘ahu. Friends from Akakū – Maui’s Community Media Television Station, Maui Canoe Club, Kīhei Canoe Club, Maui Veterans Association and members of this church – were here to remember him. Calvin’s ashes were in an urn made out of koa and cedar. Eb Wittenberg of Kahakuloa fashioned a handle for the cover out of black coral and two antlers were attached as handles. I wasn’t sure if Kiko would have sensed that something was amiss. When I met with his niece and her ‘ohana to plan the service, I asked if she could bring one of Calvin’s shirts to our gathering yesterday. Malia was by his side as his health began to decline and when he died. It took all of two seconds for Kiko to recognize Calvin’s scent. The shirt was a sign of Calvin’s extravagant love for her or perhaps more importantly her extravagant love for him. By now, I imagine most of you may be wondering what any of this has to do with Jesus and the wedding feast in Cana of Galilee long ago that comes to us from our reading from The Gospel According to John. 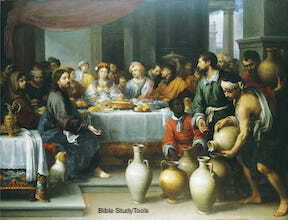 The story of the wedding at Cana is viewed by many as a miracle exposing Jesus’ supernatural power of turning water into wine. The story is especially significant since it is the site of Jesus’ first miracle and a sign of what was to come. Chapter 2 begins in the village of Cana where he turns the water into wine. Between chapter 2 and chapter 4, Jesus explains that his body is the new temple (John 2:13-25); he challenges Nicodemus to be born from above (John 3:1-21); and he offers living water to an unnamed woman at a well (John 4:1-45). He then returns to Cana to give life to the son of a royal official (John 4:46-54). The story is also about the interaction between a mother (Mary) and her adult child (Jesus). Mary and Jesus as well as the disciples are present at the feast when the wine begins to run out. Mary feels responsible. She turns to Jesus for help. Jesus is clearly reluctant to respond but he obeys his mother and turns the water into wine. The writer of John is clear about why Jesus responded. “Jesus did this, the first of his signs, in Cana of Galilee, and revealed his glory; and his disciples believed in him” (John 2:11). The story of the wedding feast provides us not only with a sign of who Jesus is but with a sign of God’s abundance. It is a sign that we sometimes find difficult to recognize. The Rev. Dr. Carol Hess, “It may seem like a travesty to turn a narrative about divine abundance into a trial of God, and yet it is passages like this one about divine extravagance that make God’s absence in the face of poverty, suffering and evil stand out. How do we reconcile a story of potent generosity with a world in tremendous need? If God is both generous and able, then apparently God continues to express Jesus’ [own] attitude: What is that to me? [But] because we trust that God wants abundance, we follow in the footsteps of [his] mother . . . prodding God for divine compassion and generosity” (Feasting on the Word, Year C, Volume 1, Bartlett & Taylor, Westminster/John Knox Press, Louisville, Kentucky, 2009, page 362). On the one hand, the purpose of the miracle was to reveal who Jesus was and on the other hand, to remind us of God’s abundance. A sign is not a miracle meant to amaze or impress any of us or an offer of proof for all of his teachings. But a sign does point the way to God’s abundance and extravagance. Although we were not witnesses to the signs themselves, we know the stories. The writer of John reminds us all: “Now Jesus did many other signs in the presence of his disciples, which are not recorded in this book. But these are written so that you may come to believe that Jesus is the Messiah, the Son of God, and that through believing you may have life in his name” (John 20:30-31). On the drive in this morning from Wailuku to Mākena, I stopped at the drive-thru at Starbuck’s at Kehalani for a tall Americano decaf with one raw sugar and cream. As I pulled up to the window the moon was in full view over Mauna Kahalewai – the West Maui Mountains. Although tomorrow is the official date of the full moon for January, it looked full enough to me. It is that time of year when I am reminded of why I thankful Maui is my home. I never noticed it before but I literally saw a sign as my eyes dropped down to the end of the drive-thru that said “Thank you.” There it was – a fluorescent-lit sign matching the color of the moon. Now about Kiko and Calvin’s shirt. Her response was not a heightened excitement but a calm recognition of what was familiar to her. I imagined in that moment that she remembered Calvin’s extravagant love for her. It reminded me of ke Akua’s extravagant love for us and the promise of the abundant life we share in Jesus Christ. We know of that abundance – not of material things; not of possessions or money – but an extravagant abundance of grace, mercy and love. By the way, Kiko was happy to know that the January full moon is often known as the Full Wolf Moon – an apparent tribute to her canine ancestors.